Tourists pose for photograph next to a mock road sign for Damascus, the capital of Syria, and other capitals and cities and a cutout of a soldier, in an old outpost in the Israeli controlled Golan Heights near the border with Syria, March 22, 2019. Saudi Arabia denounced U.S. President Donald Trump's recognition of Israel's 1981 annexation of the Golan Heights, a statement released by the Saudi Press Agency said early on Tuesday. President Donald Trump smiles at Israeli Prime Minister Benjamin Netanyahu, right, after signing a proclamation in the Diplomatic Reception Room at the White House in Washington, Monday, March 25, 2019. 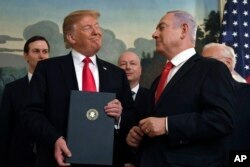 ​Trump, with visiting Israeli Prime Minister Benjamin Netanyahu looking over his shoulder during a visit to Washington, signed a proclamation on Monday officially granting U.S. recognition of the Golan Heights as Israeli territory.